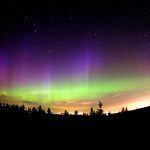 According to the article linked above, how did the Alaskan Inuit and the Menominee tribe explain the appearance of the lights? List one Fun Fact about the Northern Lights. Healthy Communities	How Do You Define Sport? I would like to hear more about some interesting facts. Take a look at some other posts. Where is the info? Max did you read the article? did you know that this is a short response? The Alaskan Inuit people believed the lights were the souls of salmon, deer and other animals they hunted. The Menominee Indians thought that the lights were the torches that were on fire of giants living in the North. Also, Solar Flares can cause the Northern Lights. P.S. I was supported by my friend Adrian for this. Thanks for including that I helped you!You helped me a lot too!!! The Alaskan Inuit thought the lights were the souls of animals. The Menominee Indians thought the lights were the torches of the giants living in the north. The Northern Lights are typically green, purple, red or blue. I didn’t know that the Northern Lights were were green, purple red and blue. that’s a good fun fact Alice! I like that fun fact! The Alaskan Inuit people thought the lights were the souls of deer, salmon and other animals like them. The Menominee Indians thought the Northern lights were the torches of giants living in the North. Did you know that The Northern Lights are actually basically illusions caused by electrons from solar winds. They are attracted to the poles by the magnetism found there. They mix with gases in the atmosphere making the glass glow. Solar flares can also cause the Northern Lights to appear. Adrian how did you get that information? Wow thanks a lot, I think your reply was awesome too!!!!! really Derrick! fin it is kind of funny! The Alaskan Inuit people believed the lights were the souls of salmon, deer and other animals.The Menominee Indians thought the lights were the torches of giants living in the North.The Northern Lights are most visible to people living in the far north. One fun fact is the northern lights are sometimes visible as far away as south as Florida. 1. The Alaskan Inuit thought the lights were souls of salmon, deer and other animals. 2. Lots of people made-up stories about the Norther Lights. The Alaskan Inuit people was thinking the lights were the heart of salmon, deer and living things. The Menominee Indians thought the lights was a torch of a giant in the North. Fun fact:Some of the visitor that come from different countries look at the northern lights. The Alaskan Inuit and the Menominee tribe explained the Northern lights, and the Menominee tribe thought the light were the torches of giants living in the North. The Alaskan Inuit believed the lights were the souls of animals. For example, salmon and deer were some of the animals. There are lots of Fun Facts about the Northern lights, but one of my favorites is they are typically green, red, purple or blue. Grace yours is so long!I like it! Sophia, I read yours and it was really good. yuwhellcome Grace and I now that is spelled wrog! The menominee tribe decribed the lights as trouches of ginats living in the north.Did you know the lights are actully electronics in the solar winds. by the shining weaponry of the immortal! This was a very good story I learned a lot of stuff about the Northern lights. The Alaskan Inuit and Menominee tribe explained the lights as there were giants living in the north with torches and one fun fact is that the lights are caused by magnetic fields. The Alaskan Inuit people believed the lights were the souls of salmon, deer and other animals. The Menominee Indians thought the lights were the torches of giants living in the North.Fun fact,near the South Pole, people may see the Southern Lights or Aurora Australia. These lights are easily to see. This is so good Amber. Sophia, yours is very interesting! I really like yours, Amber.